Kitesurfing holidays in Lancelin? Awesome. Take a road trip up north for a dozen more amazing kitesurfing spots in Western Australia. Lancelin is a tiny village on the West Coast of Australia located only about a couple of hours north from Perth. It is the most tranquil place away from the humdrum of the city and preferred for a peaceful vacation on much awaited weekends. This small crayfishing town offers a combination of the eye-soothing, turquoise flat waters, ideal specially for the beginners or kitesurfing lessons, and the outer reef break for those who love riding the ocean waves. 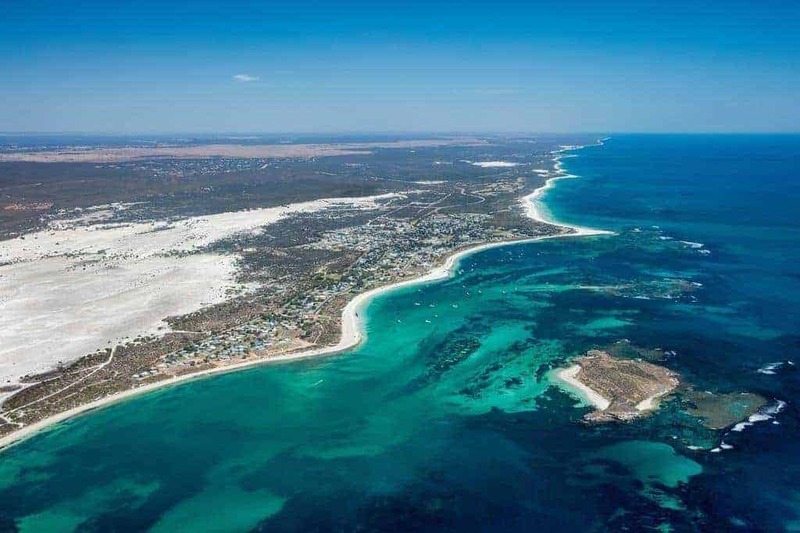 This small village is also a home to the popular Lancelin Ocean Classic race. Dating back to 1986, a few passionate windsurfers got together for a seasonal 25 km stretch downwinder race from Ledge Point to Lancelin. Since then, the Lancelin Ocean Classic became one of the best known and respected windsurfing and watersport events worldwide and attracting hundreds of visitors every year. The race is now also newly featuring the windsurfing and kitesurfing wave riding freestyle as well as the new addition of a 10km SUP race from Ledge Point to Lancelin. Generally, the best time for kitesurfing in Perth is Summer. The months between November/December until March are the windiest months known for so called ‘Fremantle Doctor’ – the most reliable and consistent breeze named after the city of ‘Fremantle’ and ‘doctor’ for the cooling relief it brings on these hot summer days. During these months, the place is just made for the wind sports. People pour in from near and far places, though it does not become too congested and remains peaceful an ideal spot for solitude-loving people. The wind usually starts offshore in the early morning and changes around as the day goes on, so by about noon, you should have a perfect and consistent breeze blowing cross onshore from the south-west. The perfect time for the ride would mostly be anywhere between 10am and 3pm. The crystal clear turquoise waters of Lancelin are mostly flat with waves further out on the outer reef. The bay is nicely shallow, perfectly suitable for the beginners. The reef goes on for about a half a mile off the shore. Lancelin offers 4 pretty good kitespots for you to enjoy. Lancelin Lagoon – the lagoon is by far the most popular spot for its mostly flat surface. The shallow water just makes it the perfect for the kiteboarding lessons or a freestyle practice session. Watch out for the reef though as it could stick out the water when the tides are low and water shallow. Main Break – this spot offers some pretty good wave riding, so if you love riding waves then you’re in for a treat. It is best to ride here in the early mornings before the wind builds up and waves are less aggressive. South Passage – another wave riding spot with very similar conditions to “Main Break”, but the waves tend to be longer and less punchy here. South Passage is also pretty popular amongst the windsurfers, so it could get pretty busy specially on the weekends, but for the less busy weekdays, you practically own the place. Back Beach – Back Beach is just opposite the Edward Island. It doesn’t have a reef and so it’s also pretty popular with the local surfers for its shorebreak. The beach is pretty big and usually chilled and quiet, so on the days when there’s not much swell and the lagoon is crowded, head here for a better session. Lancelin is around 130km from Perth and easily accessible even on the weekends. The town itself is tiny so you can just simply walk around or hire a bike. Non windy days during the season may also happen, but there’s plenty to do in case they do happen. Easy to take a stand up paddle session or book a snorkeling or fishing trip out on the reef. Dongara, the rock lobster capital of Australia and also the area of the creepy “Leaning Trees” that grow in 45 degree angle due to the strong and consistent winds in the area. Coronation Beach located just north of Geraldton; considered as one of the finest kitesurfing destinations in the world. Shark Bay Peninsular know for multiple flat water lagoons. Shark Bay is also one of the only two places on Earth where you'll be able to find the ancient, primitive form of life called Stromatolites. The second is in Bahamas. And the Sandy Bay and Graveyards Beaches located about 60 km from Exmouth. The area is located within the Cape Range National Park and the Ningaloo Marine Park and it is home to native kangaroos, echidnas and other Australian wildlife. WA offers an absolutely epic kitesurfing safari, so if you're up for it, don't miss out on some of the best kitesurfing spots in and around Margaret River.